Create Account | Lost password ? ? 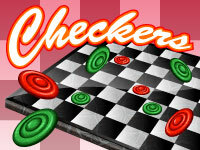 Checkers is played between two players on a checkered, squared board. The objective is to capture all of your opponents pawns or leave him with no move. Reach the opponent's back row to crown your men and gain more powerful kings. The game of international draughts is played by two, on a checkerboard with 100 squares 50 of which are playable. Only the dark squares can be occupied. The lower left corner must always be a dark square. 20 black and and 20 white pieces are set to occupy the first 4 rows of each player. Once the pieces are set, white makes the first move. The are two types of piece, both move diagonally but not the same distance. Each pawn moves forward diagonally one square. Pawns move into a square of the next row, provided it is free. When a pawn reaches the last (your opponents first) row, the pawn becomes a king. Kings move forwards or backwards diagonally. They can move as many spaces as they wish, provided that the squares are free. When the diagonal square in the next row is occupied by an opponent's piece and there is an available square (diagonally) beyond then your piece may jump over the opponent's piece. This act captures the opponents piece and it is removed from play. This is called taking a pawn. You must take any piece available to you. You may not make any alternative move. pawns can 'take' 'backwards' jumping back towards the owning player. Multiple-jump-moves: When taking a piece, you may land in a square from which another of your opponent's pieces can be 'jumped'. If this happens, you must continue to jump over the opponent's piece(s) until there is more than one piece blocking or the edge of the board is reached. The multiple-jump-move is required and you must always capture the largest number of pieces possible. During a multiple-jump-move, The pawn is not crowned a king if it only 'visits' the opponent's first row during the raid. When a king is on the same diagonal as an opponent's piece and there are one or more boxes free (beyond the opponents piece), It must jump the piece, landing in any one of the squares beyond. Multiple-jump-moves: In a capture by a king, it's likely that additional opponent's piece(s) are on the same diagonal with one or more boxes free beyond. In this case, you must continue to capture the opponent's pieces and must also capture the largest number of pieces possible. During multiple-jump-move, it is forbidden to pass more than once over a single opponent's piece. When the same board position is represented for the third time. Here are some tips for a good start in International Draughts. Firstly, never forget that Draughts is a strategy game in which you can use different tactics to defeat your opponent. It is important to understand the concept of combinations. The combinations are designed to take control of your opponent forcing him to take one of your pieces setting up a possition for you where you make take several of his. Losing pawns is not serious, neither is having less than your opponent. For example, you can sacrifice 3 of your pieces to create space to make a roundup of more than 3 pieces. To understand what a combination is and see everything offered by Druaghts, Please consult the pages of the French Federation of drafts: click here. One last piece of advice for beginners. Do not try to cross the board as soon as possible to create Kings. ©Ludi.com S.A. 2019. All rights reserved.